This is the best fish dish to ever come out of my kitchen, and might be my favorite new kind of taco. It is one of those rare meals where speed, health and taste all meet. The dish is simple in execution - just a pan-seared fish with a simple spice rub and a contrasting cool cilantro-lime topping - but the taste is restaurant quality and it is so easy to throw together. And did I mention it was light? Because it is, my friends. Easy, tasty AND good for you? Now can you understand why I'm so excited about it? The spice rub on the fish is just spicy enough and has enough of each flavor to be interesting but not overpowering. It pairs perfectly with the cilantro onion mixture on top, and so don't skip the topping unless you are deathly afraid of cilantro. I've said this about fish dishes in the past, but believe me that even if you are afraid of cooking fish, you can't go wrong with this one. It is very forgiving in that everything gets piled into a tortilla in the end, so even if you mangle the fillets horribly you'll still finish your evening feeling like a seafood rockstar. Bonus that the meal was healthy to boot. In the bowl of a food processor, combine sour cream, cilantro, lime juice and jalepeno pepper. Process until smooth and pour into a small bowl. Add sliced onion and toss to coat. Set aside. Combine paprika, brown sugar, oregano, garlic powder, salt, cumin and red pepper in a small bowl. Spread evenly over both sides of the fillets. Heat canola oil in a large non-stick skillet over medium-high heat. Add fish and cook 3 minutes on each side, or until internal temperature of the tilapia reaches 145 degrees on an instant thermometer. 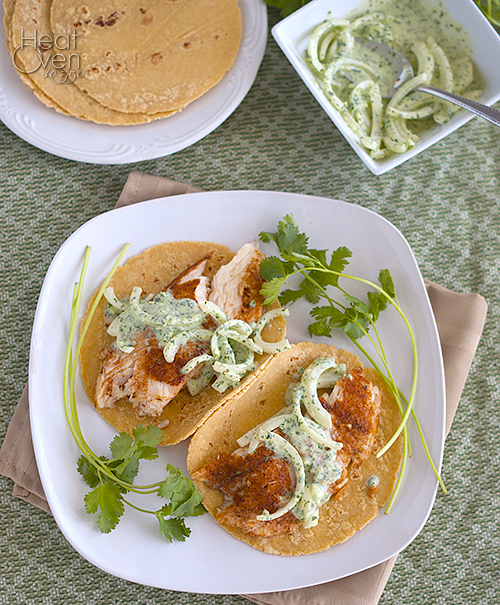 Divide fish among warmed corn tortillas and top with onion mixture and avocado, if using. Serve. Fish tacos are the best, aren't they?! I've actually made the blackened fish from this recipe (just not in tacos) and we were wowed too. So simple and so much flavor! I wish I liked fish - tilapia has a weird aftertaste to me. But bread it and deep fry it? Delish! Love the cilantro topping though - I can't get enough of that herb. My husband thinks it tastes like dish soap! This dish is my kind of dinner! Fish tacos are one of my favorite meals ever, and when I go out, if it's on the menu, I will most likely order it. I need to try this very soon -- the spice combination sounds amazing! I love the marinated onions, that looks so good! I am a big fan of fish tacos, but sadly no one else in my house likes fish! I always struggle with Tilapia since it's not my favorite fish so adding lots of spice to camouflage the flavor sounds like a great idea.